Bathtub liners are perfect for Murfreesboro homeowners who want to improve the look of their bathrooms without breaking the bank. This economical bathroom renovation service from American Home Design allows homeowners to resurface their bathtubs without the expensive cost and time-consuming task of installing a brand new tub. 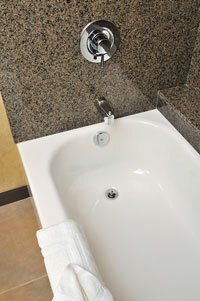 In fact, unlike full tub replacement projects, many bathtub liner projects can be completed in as little as one day. In addition to being quickly and economically installed, bathtub liners offer other benefits for Murfreesboro homeowners. For instance, our bathtub liners are made of durable acrylic that is resistant to chipping, cracking, or fading. They also require little maintenance since they’re resistant to mold and bacteria growth. Plus, unlike other tub resurfacing products, our liners won’t fill your home with harmful chemicals and fumes while they’re being installed. When homeowners in Murfreesboro have their new bathtub liners installed by American Home Design, they’ll receive top-notch service from a company that has received an A+ rating from the Better Business Bureau since their first year of operation. We’ve proudly served more than 30,000 satisfied homeowners since 1977 and remain one of Murfreesboro’s only locally owned and operated home improvement companies. We offer a full selection of bathroom remodeling services, including bath and shower wraps, tub to shower conversions, safety tub installation, and more. We also offer a number of services to improve the energy efficiency of your home, including the installation of vinyl windows. Contact us for more information and to learn why so many Murfreesboro homeowners choose American Home Design for their home improvement needs. We are very pleased with the sunroom American Home Design installed. They worked very efficient and professional.